More than 100 people sought refuge at a pub high on Bodmin Moor overnight after heavy snowfall hit the A30, leading many stranded motorists to abandon their cars. Some of those reaching the Jamaica Inn reported trudging through snow for several miles after more than 12cm of the white stuff brought "chaos" to the cross-country route on Thursday. 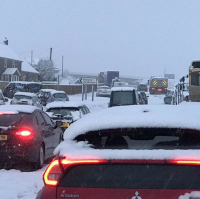 The pub's 25-year-old general manager, Sammy Wheeler, said groups and families with young children arrived in droves after around 100 cars got stuck on a nearby stretch of the A30. "A lot of people have abandoned their cars. Some of them have walked a good three, four or five miles," she told the Press Association. Each of the inn's 36 rooms was full, with some being shared by complete strangers on Thursday night. Meanwhile makeshift dormitories with mattresses on the floors were set up in other parts of the pub, including 15 beds in the restaurant another five in the lounge. Paul Drye, 54, from St Austell, Cornwall, was heading home after working in Dorchester, Dorset, on Thursday afternoon when he became stuck on the A30 around 3.30 pm. He said: "There had been a bit of heavy snow but while everything was moving it was fine, but as soon as there was a few incidents up ahead everything ground to a halt. "You never know how long these things are going to last, whether it will be moving in two minutes or four hours as it turned out." Mr Drye arrived at the Jamaica Inn around 7.30 pm and was met with a real "cross-section" of people including dogs, children and truck drivers. "People were still arriving until the early hours of the morning, people who had left their cars and walked, a couple miles some of them," he said. Spirits were said to be "incredibly high" among the guests, who included around a dozen children and an eight-month-old baby. The pub's seven staff, including two chefs, were pulling out the stops to make sure all were comfortable - although they were "in for a long one," Ms Wheeler said. "Credit to my staff - a shout-out goes to all of them," she added. The area is under a yellow weather warning of snow and ice until Friday afternoon and efforts continued through the night to clear the A30 and get people moving again. Speaking to the Press Association at 7.30 am on Friday morning Mr Dyre said some travellers had already left to walk back to their cars and that from the Inn they could see traffic on the A30 was moving again. Next time you're heading away domestically, check out our UK trip travel insurance options to guard against unexpected circumstances.